Animal lovers with good intentions should be praised for their caring ways. But sometimes, people who believe they are rescuing animals that have appeared to go astray can be doing more harm than good. This theory especially applies to baby animals. CROW officials admit that one of the busiest places in the clinic is the baby room. During spring months, the room is filled with baby mockingbirds, baby mourning doves and other baby bird species. 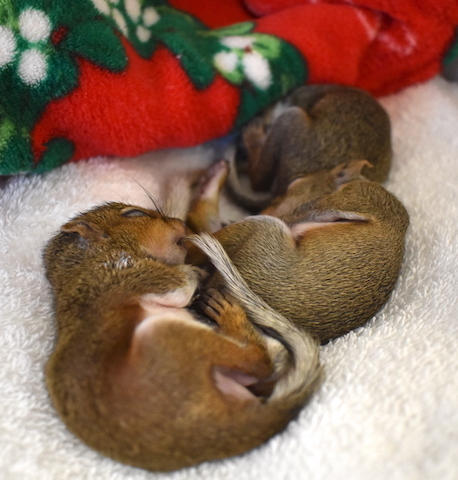 This time of year, the room is filled with baby eastern gray squirrels. 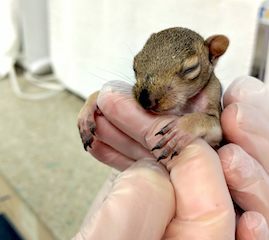 Unfortunately, most of these young squirrels have reportedly fallen from their nest or been dislodged during strong storms. In many of these cases, the immature mammals are in good health and are brought to CROW unnecessarily. 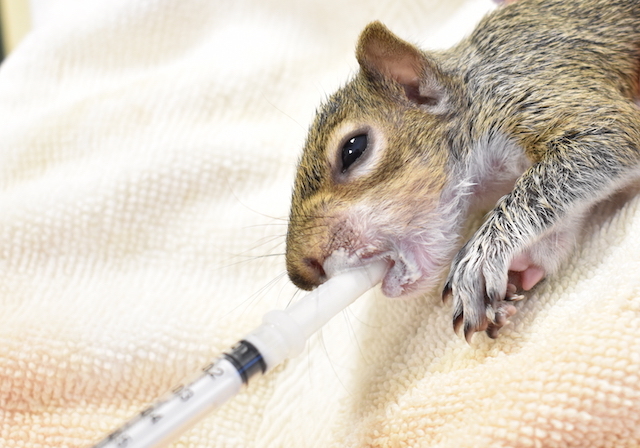 Caring for a high number of baby squirrels is time-consuming due to the necessity of numerous feedings and incubator cleanings throughout the day. As squirrels get bigger, they are transitioned from a specialized milk diet onto a diet of solid food such as fruits, nuts and vegetables. Once old enough, they are moved to an outdoor enclosure until they are ready for release. In most cases, it is best to leave these little animals alone unless there appears to be a clear injury or a fallen nest. 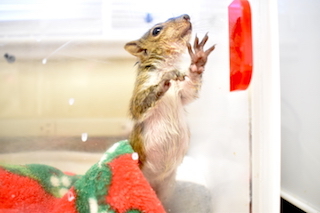 A wildlife rehabilitator should be contacted before bringing the animal in for help. “If the original nest was destroyed and/or you cannot reach it if it is too high up in the tree, you can put the babies in a faux nest as close to the original nest as possible, and mom will retrieve the babies and continue to care for them,” said Dr. Bast. “To make a simple temporary nest, take a small plastic container, poke small holes in the bottom to allow for drainage if it rains, place some nesting material (like) pine straw, leaves, or grass inside, and secure this to the tree trunk or nearby bush, then place the babies inside. Putting the nest as high as you can reach may help prevent certain predators, such as feral cats, from discovering and disturbing the temporary nest until mom moves the babies." 'If you care, leave it there' is the best rule to go by when it comes to baby animals. Most babies that are found outside of the nest are still receiving care from the parents, and may be going through normal development phases of exploration. These babies are often inadvertently 'abducted' by a concerned person who does not realize that the parents are still providing care for the babies. "Although our nursery is staffed with trained caregivers, there is no substitute for the real parents – in addition to providing feeds, the real parents ‘teach’ natural species behaviors which are important for survival and which we cannot fully mimic in a nursery environment. If you find a baby animal, do not assume it is orphaned. Please call CROW and we will work with you to determine if re-nesting is possible or if medical care is warranted based on the individual situation.” says Dr. Bast. 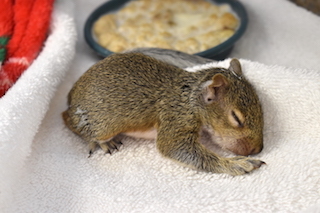 If a finder ever needs advice on what to do if you find a baby squirrel or how to construct a faux nest, call CROW at (239) 472-3644 ext. #222.